Grassroots Enterprises - Brenda Herchmer Grassroots Enterprises - Article: Gene Simmons Raving About Canadian Civility? 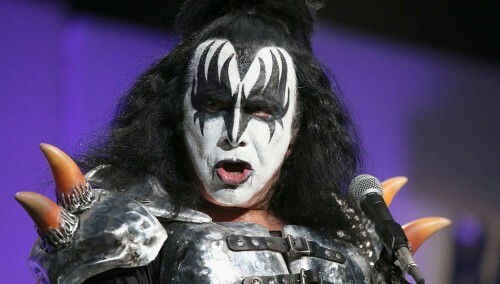 Last week American Gene Simmons, best known as the demonic, blood spitting bassist with a creepy waggling tongue in the 1970’s hard rock band called Kiss, was a guest on a Canadian talk show. Not being a huge fan I wasn’t paying a lot of attention especially when he ranted somewhat about the accumulation of money being the only way to measure success. He did however get my attention when he waxed poetic about the warmth and friendliness of Canada. He also suggested that Canadians could teach Americans a thing or two about one of our greatest strengths – civility. It wasn’t until the next day, overhearing a conversation between an elderly woman and a sales clerk, that I thought more about it and realized civility is more than simply being nice or polite to one another. As the woman purchased a pair of pants and socks at a ladies clothing store, the sales clerk learned that she and her husband had just recently moved back into the city after living for years in a small, more northern community. When the sales clerk asked the woman how they were enjoying the city, the woman shrugged, smiled somewhat sadly and said that while it meant they were closer to their daughter, they were lonely and missed all their friends back home. While many would simply have smiled and hurried through the transaction in order to avoid spending more time in the woman’s depressing presence, this salesclerk smiled and asked another question, “Do you live close to the mall”? When the woman replied that they lived a block away, the clerk suggested they look into the Mall Walk program. As she pointed out, the popular early morning program was a safe way to get fit in a warm and safe environment. However, she went on to add, the post walk coffee club is a good place to meet new friends. She described the walking club community so vividly you could see the woman’s interest was piqued and more details were subsequently exchanged. As I thought about the conversation, I realized that I had witnessed what Gene Simmons had talked about as an exchange of civility. It was more than just being nice or polite, the salesclerk had extended a spirit of neighbourliness and a sense of caring. She was demonstrating social responsibility or what my mother and grandmother repeatedly taught as “Do unto others as you would have them do unto you”. For sure if it was my mother who had been uprooted and moved to a new city, I’d like to know there would be others reflecting the same spirit of civility as that salesclerk. Sadly, I think civility is on the decline in today’s often materialistic, time starved world. However if we agree we want to see more of it, how do we go about it? It seems to me that while we can encourage civility by teaching empathy to children it’s probably more important that we model it. For all of us ensuring civility will be about conducting ourselves with integrity, courtesy, and respect toward fellow members of our community. We’ll all need to hold each other accountable for our actions and promote an environment where individuals feel safe and supported. Mostly though, it might be about behaving in a way that encourages connections. Perhaps we should all begin by ignoring our many distractions and work harder at paying more attention. Real civility just might begin with us putting down what we’re doing and simply being in the moment with one another. The moment of human connection begins with us doing what that salesclerk did…paying attention and listening with empathy. When we speak of Canada as a country we are proud to call our own, and as a place where we want to raise our children and our grandchildren, it is in large part due to the civility and quality of life we have in our communities. As such, civility isn’t just a value-added, it is perhaps who we are as Canadians. As such, it’s something worth fighting for. What a wonderful thing to witness - someone being real, authentic, and giving. Sometimes I think we forget that being civil doesn’t cost anything, except a moment of time. And, more than one person benefits: the receiver, giver, and even others around to see it happen. Then, that process can easily spread: a good contagious spread of civility. I just finished reading your article about Civility and Canadians and I couldn’t agree more. You expressed it so well. It is indeed an important part of who we are as Canadians and something we should all remember when we are unfortunate to come across a lack of civility. Of course, even if she doesn’t go to the mall walk, for just a few minutes someone let her know that they value and care about her wellbeing - and hopefully eased just a little of the loneliness for a few moments. If she does go, imagine what an ambassador she’ll be to bring other newcomers to the program.